How did the GOP get away with destroying our middle class and slashing our social safety net? The ‘Powell Memo’ gave them the blueprint. Photo from Wikipedia. "This may sound like a hyper-partisan article. It is not. It is based on actions by Republicans of all stripes that are verifiable and quantifiable. All Americans are being played irrespective of party affiliation. Republican leadership and political sidekicks are the masters of the game, the citizenry the pawns, and all the brainchild of one Lewis F. Powell, Jr.
"Republicans have never been known as a party fighting for the poor or the middle class. They have never been known as a party that believed in a social safety net. The problem for Republicans is that 90+% of Americans fall into that category. "The level of intolerance by the GOP is incomprehensible until the strategy is understood. It is easy to dismiss comments by a few. However when it becomes a chorus line that is perfectly synchronized, it becomes a strategy. "Republicans balk when one speaks about the Republican war on women, war on the poor, war on the environment, war on gays, war on minorities, and many other select micro wars. They don’t want these wars called out. And the reality is these should not be called wars at all. It is much too simplistic. "It is a war on democracy. How do you win a war on democracy when there are many more subjects than you? You fight many battles. So the battle against the poor, the battle against women, the battle against gays, the battle against minorities, the battle against education, and any other micro battle to keep the subjects occupied is the modus operandi. It does not matter if in the process a few of the battles are lost. After all their eyes are on the ball, the destruction of a functional democracy. "It was all in the Powell Memo. 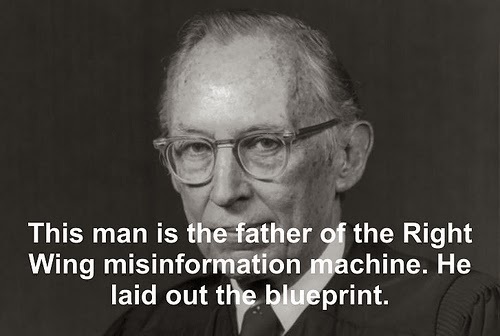 "Written by Lewis F. Powell, Jr in 1971, , the Powell Memo illustrates the fear that the corporate lawyer and member of the boards of varies corporations had for the masses. Powell was subsequently confirmed as a Supreme Court justice. :Powell lays out the game plan. The Powell Memo is a plan that was forward looking. It is a plan that so far has been well implemented. How did they do it? "The Powell Memo was the blueprint for the GOP’s successful strategy. "The Powell Memo came up with the plan, the blueprint. Based on the ideas presented in the Powell Memo, the Republican party created think tanks responsible for dispersing misleading information with a false cloak of authenticity. The Heritage Foundation is a classic example of this. 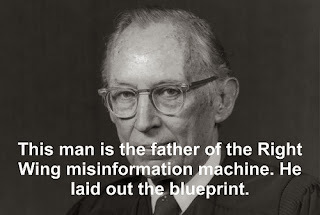 They took control of the airwaves to disperse misleading information (e.g., talk radio, Fox News, CNBC, etc.). A relenting Chamber of Commerce uses corporate monies to bully policy and politicians that squeeze the masses (e.g., support for free trade agreements, outsourcing etc.). "They infiltrated college campuses with directed research for planned outcomes as detailed in the Powell Memo. The GOP infiltrated the elementary and secondary schools’ textbook evaluation process to attempt Right Wing indoctrination. The Powell Memo suggested the use of graduate business schools to indoctrinate students on an irresponsible form of capitalism. They flooded the country with books and paid advertising promoting their message. The Powell Memo came down against the unions. "The implementation has been successful thus far. The problem is that in Powell’s days there was no Internet. There was no way to form disjointed communities in mass that could rise up when knowledge was not controlled in a top down manner. A new tactic had to be added. This new tactic is not new. 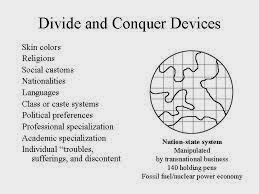 It is the war to divide and conquer. 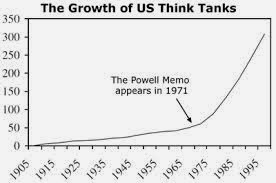 "The current strategy is simply a modification of the Powell Memo to achieve the same result. "If one keeps a community, a city, a country in a constant state of disarray or chaos, it is easy for the subjects to take their eyes off real problems. That is the same tactics use in countries where a functioning Plutocracy reigns like Panama and many ‘third world’ countries around the world. Underlying human behavior is the same throughout the world. The world then becomes the testing ground for successful suppressive tactics. The successful ones are effectively being used against Americans now. All of this is based on what is found in the Powell Memo. "All the little battles described above occurring at the same time are nothing more than death by a thousand cuts. Americans are so busy trying to survive, fighting these culture battles and sub-class battles that they are unable to fight what really ails. 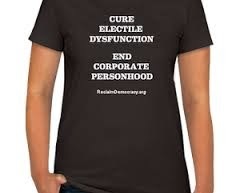 What ails is the Plutocracy Powell’s memo aimed to preserve. The Republican assault on the fabric of America is but the implementation of the Powell Memo." 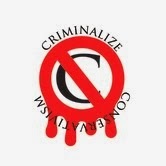 "In 1971, Lewis Powell, then a corporate lawyer and member of the boards of 11 corporations, wrote a memo to his friend Eugene Sydnor, Jr., the Director of the U.S. Chamber of Commerce. The memorandum was dated August 23, 1971, two months prior to Powell’s nomination by President Nixon to the U.S. Supreme Court. 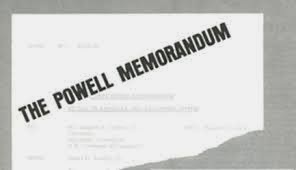 "Though Powell’s memo was not the sole influence, the Chamber and corporate activists took his advice to heart and began building a powerful array of institutions designed to shift public attitudes and beliefs over the course of years and decades. The memo influenced or inspired the creation of the Heritage Foundation, the Manhattan Institute, the Cato Institute, Citizens for a Sound Economy, Accuracy in Academe, and other powerful organizations. Their long-term focus began paying off handsomely in the 1980s, in coordination with the Reagan Administration’s 'hands-off business' philosophy. "Most notable about these institutions was their focus on education, shifting values, and movement-building — a focus we share, though often with sharply contrasting goals. "So did Powell’s political views influence his judicial decisions? The evidence is mixed. Powell did embrace expansion of corporate privilege and wrote the majority opinion in First National Bank of Boston v. Bellotti, a 1978 decision that effectively invented a First Amendment 'right' for corporations to influence ballot questions. On social issues, he was a moderate, whose votes often surprised his backers." "Washington and Lee University has created this archive (pdf) of significant follow-up communications to the Powell Memo. "On the occasion of the memo’s 40th anniversary, Bill Moyers’ website posted useful background and commentary." Conservatives have always hated democracy, and the idiotic bleating of their Sheeplets, who call our system "a republic, not a democracy," with little understanding of what they're parroting, has grated on our ears for decades. For those who have doubted our belief that Conservatism is a vast, criminal plot, the Powell Memo helps prove otherwise.